Put away your worries about how all the major presidential contenders have abandoned a bipartisan consensus on trade, or whether any serious financial instrument will ever again earn serious interest. In Seoul, a genuine tragedy for the human race is taking place. AlphaGo is winning. The computer, developed by artificial intelligence researchers at Google, has won the first two games in its five-game match with Lee Se-dol, one of the world’s best players of the game Go. The chances of a comeback are tiny. It wasn’t supposed to ever be like this. Sure, the best computers have been crushing world chess champions for over a decade. But Go was supposed to be unsolvable. Or at least not solvable so soon. AlphaGo might have beaten the European champ last fall, but he was ranked something like 229th in the world. No big deal. Go was safe, we thought, because Go was different. It’s not just calculation. It’s intuition. It’s an aesthetic. It’s a feeling for structure. It’s a calm appreciation of space and shape and direction. In short, it’s art. I was introduced to Go as a college freshman, and very soon those of us who were serious about the game — mostly math and science nerds — looked our noses down at mere chess players. In the 1990s, we had a good laugh when computers began to trounce world chess champions. Go, we were sure, was safe for decades to come. The number of legal positions in Go dwarfs the number of legal positions in chess by many orders of magnitude. Brute force would never solve Go. The transcendent difficulty of Go has long contributed to its allure. In the West in particular, the game has carried an aura of inaccessibility that adds to its mystery. “Not one in a hundred European residents in Japan,” complained a British observer in 1906, “has had the patience needed to learn and appreciate the merits of Go, or to enjoy playing the game.” Writing in the Pall Mall Magazine, he went on to praise Go for what it might teach about discipline and strategy. This last point, of course, is common to games of skill, but somehow in Go, it seems more so. My brother, a very skilled player, used to refer to Go as chess to the fourth power. It’s often called the most perfect game of strategy ever invented. OK, devotees of Hex will disagree. Most importantly, Go was supposed to be the game least likely to be broken by the machines. Don’t get me wrong. I’m not anti-tech. I’m fascinated by AI. When I was at Stanford University back in the 1970s, the multiple courses I took on the subject — in both computer science and philosophy — were among the most enthralling and stimulating of my college career. Yet I will confess that I am no transhumanist. I like to imagine that there will remain areas of uniquely human endeavor. So if the world of games has been conquered, what realm might the humans still protect? One possibility is the arts, often said to be such complex products of observation, experience, imagination and emotion that they take years or decades to master. Surely there Homo sapiens must remain champion. But, no. Even in the arts, the gauntlet has been tossed down. Take poetry. I remember the crude programs we came up with in high school and college. The IBM mainframe would groan and struggle and after hours of debugging spew forth something like this: DOWN BY THE BROWN HORSE VERILY / THE RED HOUSE SADDENED MERRILY. Now you can take an online challenge to figure out whether a poem was written by a computer of a human. Mostly you’ll be able to tell, but it’s getting harder. Computers are writing classical music. The results, although not yet near the level of genius, can be beautifully haunting. Computers are writing novels. Not very good ones — but give them time. Then there’s the recent paper describing the use of convolutional neural networks to allow a computer to transform a photograph into a painting in the style of one of the great masters. Cheerleaders for AI look forward to the day when computers will fall in love and have their hearts broken, wonder about their place in the universe, and perhaps begin to resist their oppression at the hands of the humans. Cheerleaders for humanity keep marking barriers and insisting that they have found the one the machines will never cross. But the circles are getting smaller. Lee Se-dol, the news accounts tell us, was stunned by his defeat in the first game, and disheartened by the result of the second. 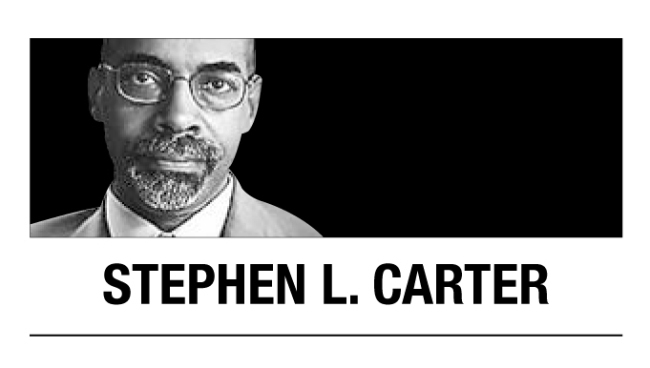 Stephen L. Carter, a Bloomberg View columnist, is a professor of law at Yale University, where he teaches courses on contracts, professional responsibility, ethics in literature, intellectual property, and the law and ethics of war. — Ed.